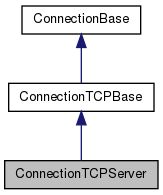 This is an implementation of a simple listening TCP connection. Definition at line 36 of file connectiontcpserver.h. 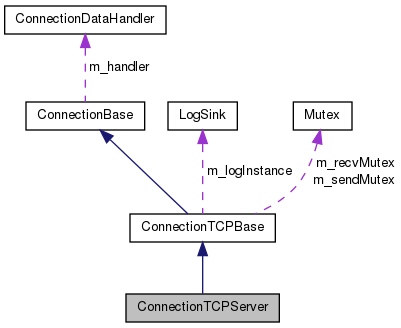 Constructs a new ConnectionTCPServer object. ch An ConnectionHandler-derived object that will handle incoming connections. ip The local IP address to listen on. This must not be a hostname. Leave this empty to listen on all local interfaces. port The port to listen on. Definition at line 58 of file connectiontcpserver.cpp. Definition at line 65 of file connectiontcpserver.cpp. This function actually starts listening on the port given in the constructor. Definition at line 74 of file connectiontcpserver.cpp. Definition at line 69 of file connectiontcpserver.cpp. Definition at line 105 of file connectiontcpserver.cpp.